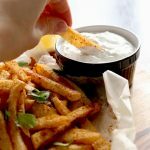 Inside Scoop: If you’re looking for a low-carb, delicious treat that tastes just like fries, check out this recipe for Spicy Baked Jicama Fries With Dill Yogurt Dip. The jicama, A.K.A. ‘Mexican Water Chestnut’ is not something you typically pick up in your local supermarket. Maybe that’s because you don’t know what it is, or maybe because it doesn’t look specifically appetizing; but, don’t get this little tuber wrong…It is pretty darn awesome! A lot of people use it raw; you can spiralize it or add to salads because it has an amazing crunchy texture (we would put it in a category between a potato and an Asian pear), and it is takes on any flavour you want to give it. But, because we’re all about finding ways to add spice to vegetables, baking them and making sure we have dips that go alongside, we wanted to create a recipe that’s not only delicious, filling, but incredibly nutritious. 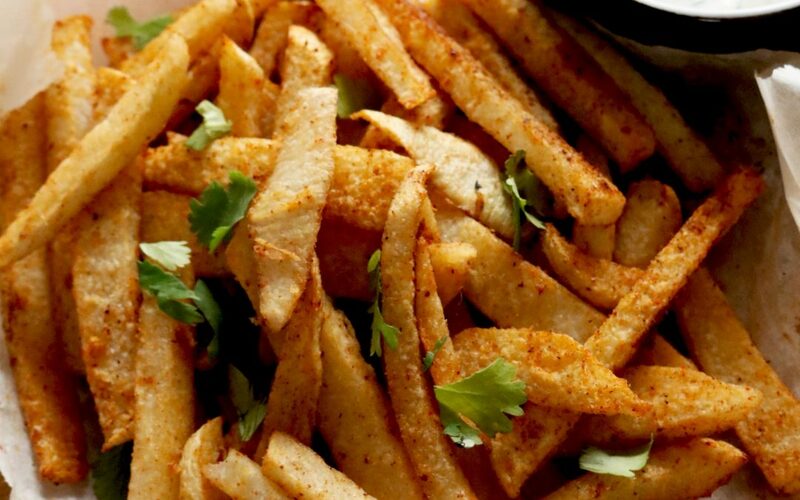 Hence, these Spicy Baked Jicama Fries. The jicama root is such a unique vegetable with an incredibly high amount of fibre per serving. Almost 30% of your daily recommended intake, as a matter of fact, which makes it a wonderful addition to your diet for the cleansing effects that fibre has. Not only is it high in fibre, but it’s high in something called oligofructose inulin, which is a soluble pre-biotic fiber that is a zero calorie sweet inert carbohydrate, which means its amazing for diabetics or people who have blood sugar imbalances, and the perfect potato substitution. 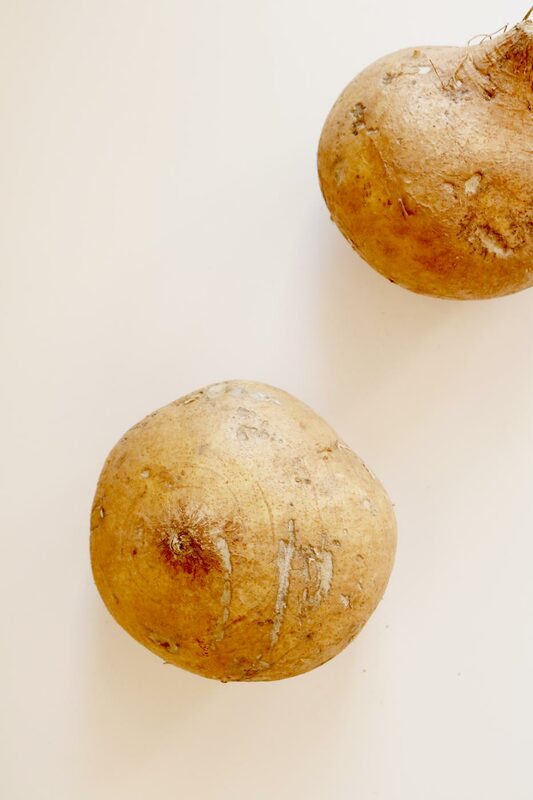 You can eat jicama raw, with a bit of lime juice and chili, in salads, or check out our favourite way to cook up baked jicama fries. Are you willing to put jicama to the test? 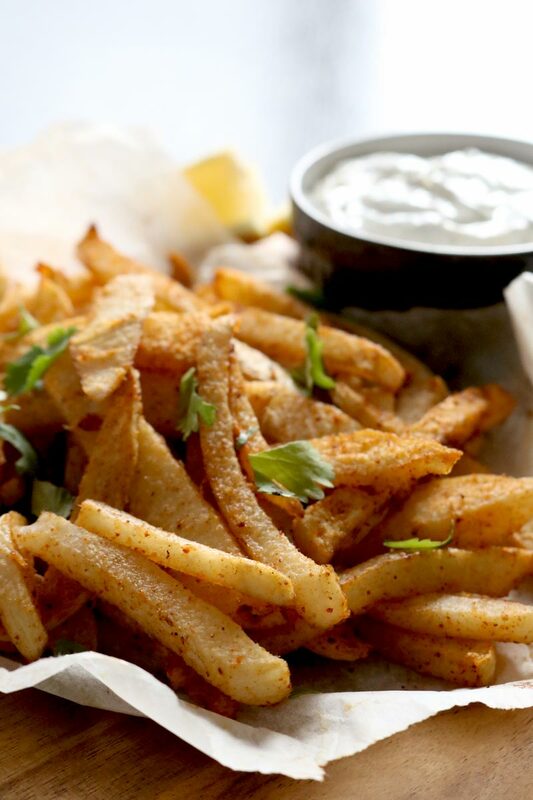 Let us know about your baked jicama fries experience in the comments below. 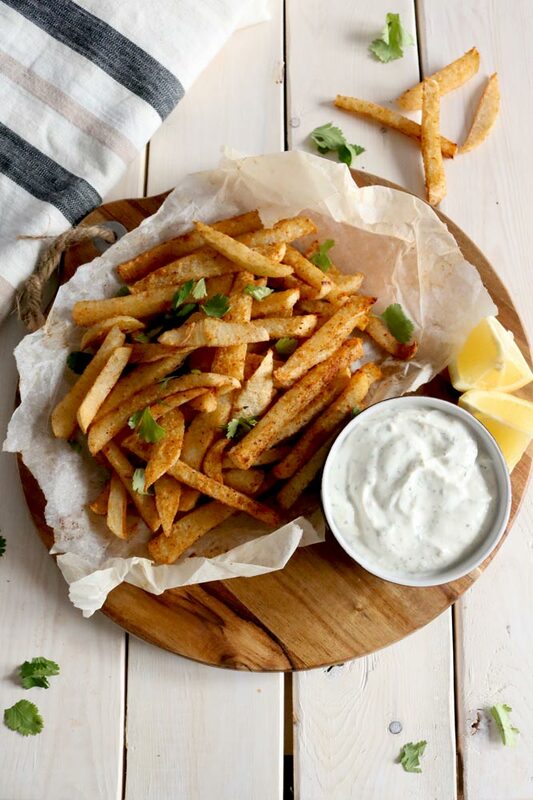 And, if you’re totally digging these easy and delicious spicy jicama fries, you’re going to want to check out this amazing 5 Ingredient Cookbook that we’ve put together, plus a little DIY 5 Day Challenge that will get you cooking healthy, simple, foods with ease. In this cookbook you’ll get delicious recipes like these baked jicama fries, and these delicious 5 ingredient Paleo Chocolate Chip Cookies. 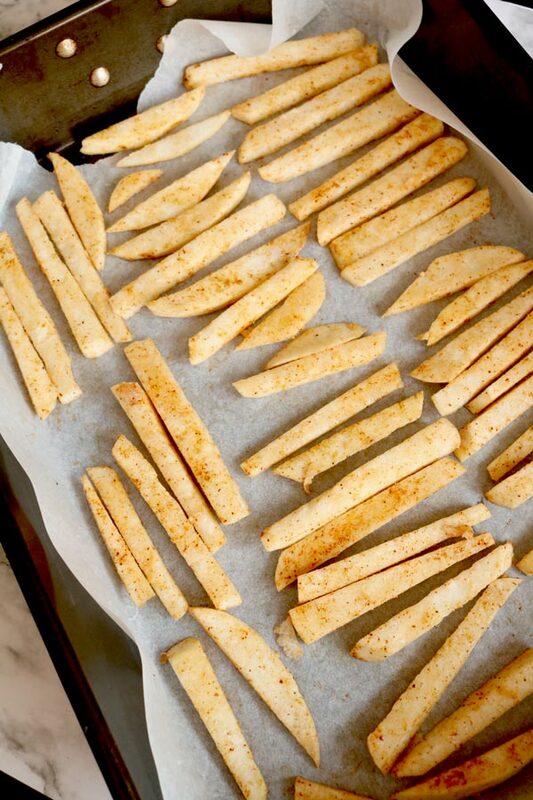 Toss this little beauty in oil and spices and whip up jicama French fries in no time. Toss Jicama with seasoning and oil in a large bowl. Place on cookie tray or baking sheet (make sure not to overcrowd). Cook for 40 minutes turning half way. For the yogurt dip, just mix all the ingredients. 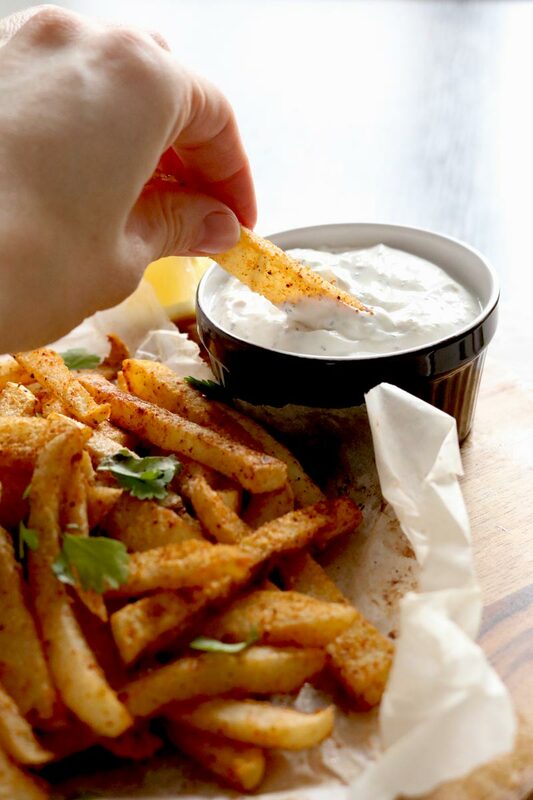 Serve the fries with the the yogurt as an appetizer or snack. Jicama have a crunchier texture than potatoes when cooked. We love this texture, but if you would rather have softer potatoes you can par-boil them for about 8-10 minutes before cooking. You may need to reduce cook time, keep an eye after 20 minutes of cooking. They should crisp up nicely. These look delicious! Pinning for later… ? They’re so good 🙂 Let us know how it goes.